Merry Christmas everyone! Today I’m guest posting for A Jillian Vance Design, (they gave me the stamps to use) and I’m so excited to share this little gift bag! While it is a small bag, about 4 x 5″, it has plenty of space to hold good things! It would be perfect for gift cards, jewelry boxes, or candy! I used a pre-cut tag, and stamped the little corner doily from the Daily Doilies Stamp and Die set, heat embossed with silver EP. I love how the intricate detail of the stamp shows when embossed! 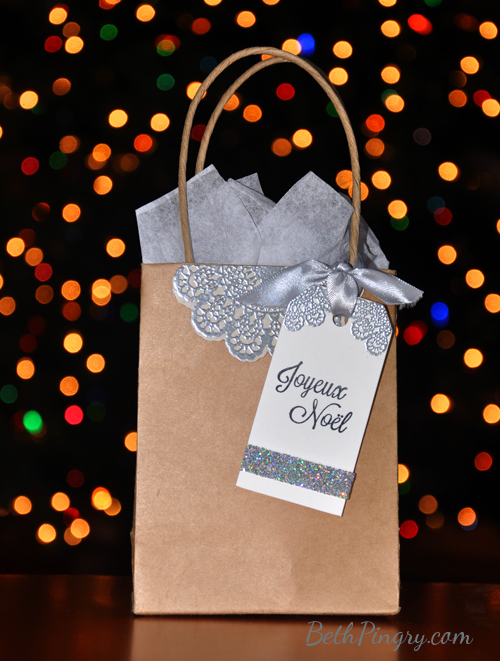 I stamped Joyeux Noel, from The Holiday Zipper set. I actually cut the two words apart and aligned them on the acrylic block. The line of glitter is 3D Foam Tape. I tied it to the bag with some ribbon from my stash. For the bag decor, I stamped, embossed and die cut the largest of the Daily Doilies and then cut it in half and adhered it to the top edge of the bag. If you wanted to seal the bag shut, you could use the complete doily folded over and adhered at the top. It was quick and easy, yet sparkly and elegant! The only problem now is, I love it so much I don’t want to give it away! Thanks for coming by today, and have a wonderful holiday! Blog Hop Alert! 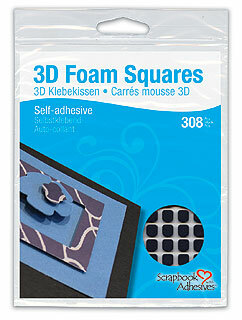 This week Scrapbook Adhesives® by 3L is blog hopping with Core’dinations. 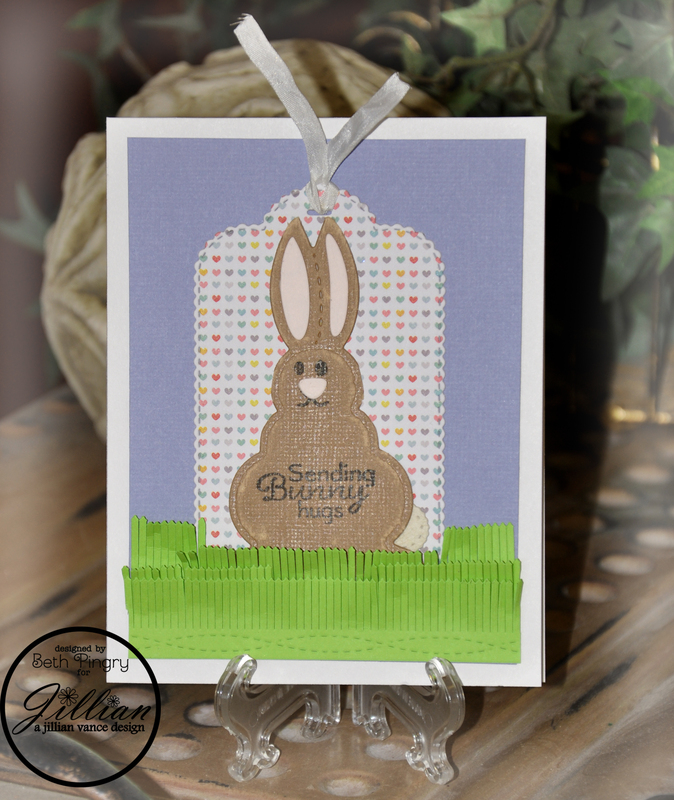 I have this card on the blog, click on over, leave a comment each day this week on both Scrapbook Adhesives by 3L’s blog and Core’dinations blogs to enter to win great prizes!! 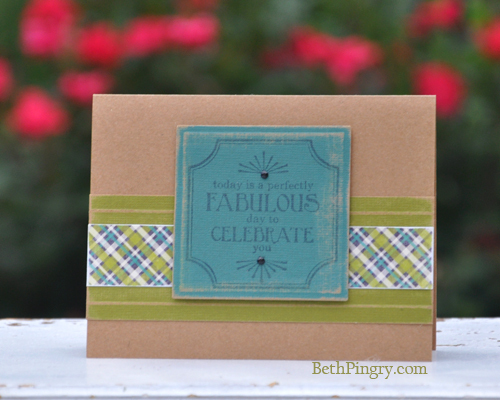 Spellbinders and Core’dinations Blog Swap! 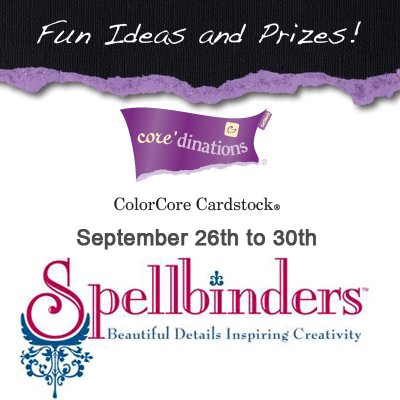 Today is my day for the Spellbinders™ and Core’dinations® Blog Swap! 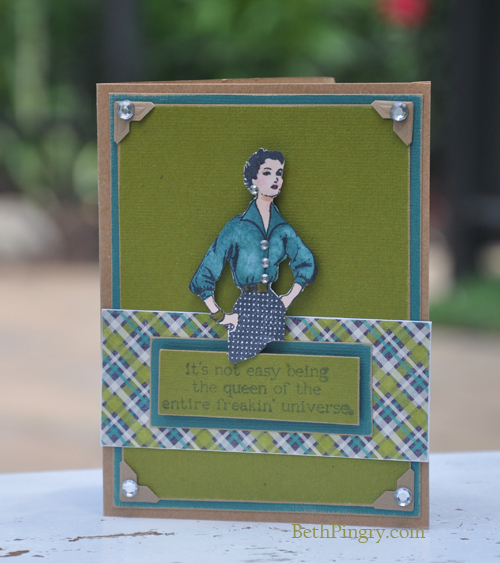 So easy, in fact, that you can make this in one cut/emboss pass using the Spellbinders Grand Calibur® machine! I took a piece of Core’dinations Black Magic Cardstock and cut the front edge with a Spellbinders Edgeabilities® Classic Petal Edger die and one of the Decorative Inserts from the same set. At the same time, I cut the Fancy Tags Three and Labels Twenty dies. In the embossing step I added a Classic Rectangles LG die to just emboss the frame onto the front of the card, and the rest of the dies embossed in that pass as well. 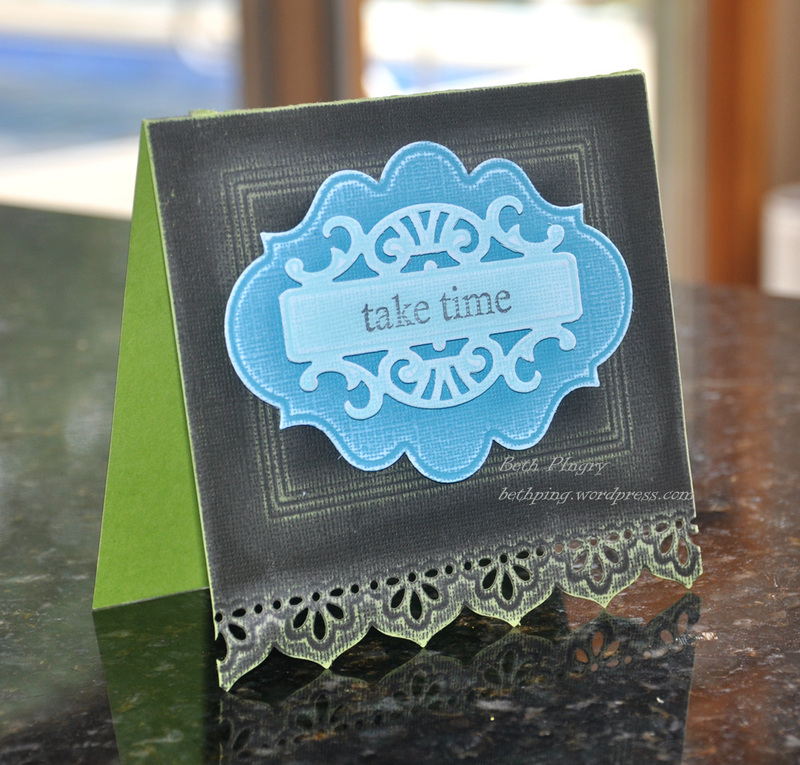 I stamped ‘Take Time” from the Gina K. Designs The Best Things in Life set on the Fancy Tag, with Clearsnap Colorbox Black Pigment ink. then sanded the embossed areas of all the die cuts, and also around the edges, including the card base. I love how the colored core shows through! 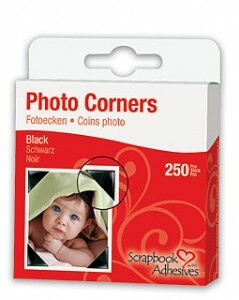 And Core’dinations cardstock is nice and sturdy, it’s great for die cutting and card making. A little bit of adhesive from SCRAPBOOK ADHESIVES BY 3L, 3D Foam Squares, and the card is done! Don’t you love how the Spellbinders Edgeabilities dies make the fabulous edge!! 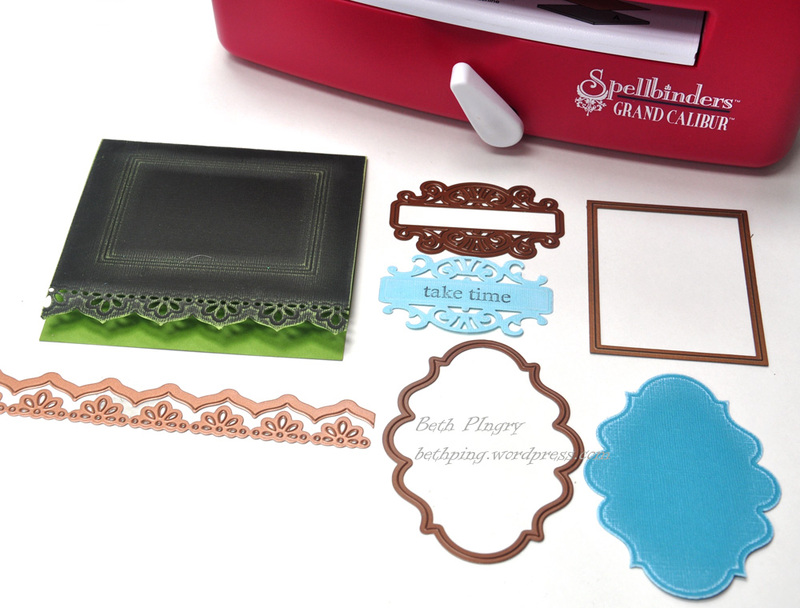 And now for the contest details..
Leave a comment to enter to win a set of Spellbinders Dies! 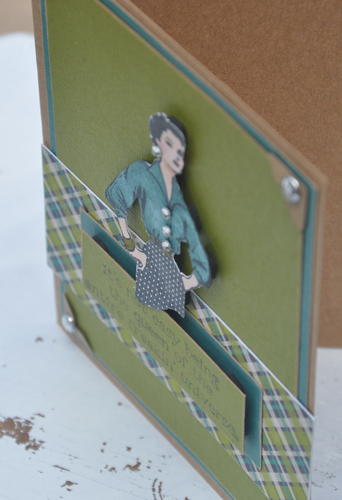 And be sure to visit Tonya Dirk’s blog today too…and the other Spellbinders designers from Days 1-4, you can find links on this Spellbinders Blog post. And then hop on over to Core’dinations to see their fabulous creations! 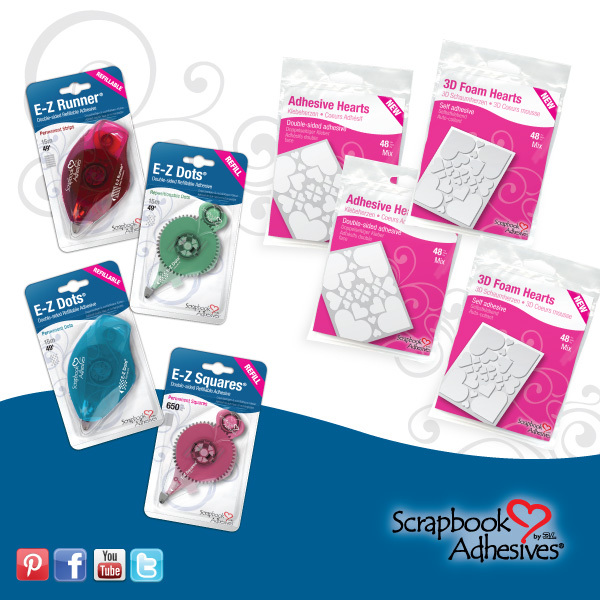 Spellbinders on Facebook , Twitter and the Spellbinders Blog! Series, Kraft-Core and various other wonderful cardstock lines. See them on Facebook too!